The State Department angered Congress by announcing that it did not plan to impose new sanctions called for by law. And the Treasury Department angered Moscow with a new name-and-shame list identifying 210 senior Russian political and business figures. MOSCOW — The Trump administration managed the unusual feat this week of outraging both Russia’s leaders in Moscow and Russia’s biggest critics in Washington with its handling of a new law intended to punish the Kremlin for interference in the 2016 U.S. elections. The State Department angered members of Congress by announcing on Monday that it did not plan to impose new sanctions called for in a measure that President Donald Trump reluctantly signed into law last year. And the Treasury Department angered Moscow late Monday night — Tuesday morning in Russia — with a new name-and-shame list identifying 210 senior Russian political and business figures. The twin announcements left a muddled impression of how Trump plans to approach the Kremlin in his second year in office even as investigators search for evidence of collaboration between his campaign and Russian agents. His domestic opponents complained that once again Trump seemed to be in thrall to Russia, while the Kremlin complained that he was a captive of what it described as the American deep state. On Capitol Hill, lawmakers criticized Trump for not imposing additional sanctions on Russia as envisioned in the legislation passed over his objections by veto-proof bipartisan majorities in both houses in August. The new law made Monday an important date for action. The law required Trump to begin imposing sanctions on large purchasers of Russian military equipment. But the State Department said it did not need to do so at this point because it had been using the threat of the law in recent months to press customers to cancel potential deals that would have been worth billions of dollars to Russia. The law also directed Trump to produce a list of “senior political figures and oligarchs” in Russia. No actions were required against those on the list, but it was meant to signal those close to Putin that they had much to lose if Moscow does not pull back from its intervention in Ukraine and its interference in Western elections, and the prospect of being included alarmed many in Russia. Grilled by Democrats during a congressional hearing, Treasury Secretary Steven Mnuchin rejected suggestions that the administration was delaying action on Russia and said that additional action would be taken. “There will be sanctions out of this report,” he said. But when Sen. John Kennedy, R-La., pressed him on whether he agreed that Putin “has acted like a thug,” Mnuchin demurred. The announcements came just days after two senior Russian intelligence officials traveled to Washington to meet with Mike Pompeo, the CIA director. Sergey Y. Naryshkin, director of the foreign intelligence service, was in Washington last week for consultations on terrorism, according to Russian state media, even though he was sanctioned by the U.S. government under President Barack Obama. According to a U.S. official, he was accompanied by Alexander V. Bortnikov, director of the domestic intelligence service, who has not been sanctioned. The CIA would not confirm the meeting but said any interactions would have been in accordance with American law. 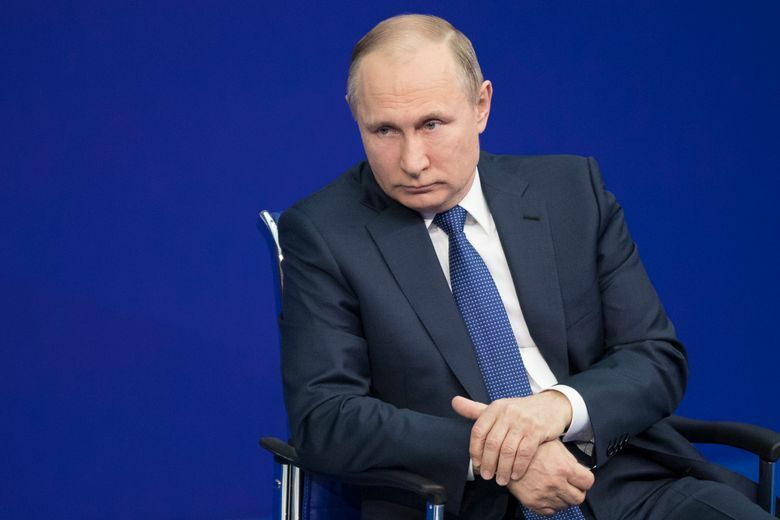 Government figures on the list include more than 40 of Putin’s closest advisers; all 30 members of the Cabinet of ministers, including Prime Minister Dmitry A. Medvedev; and the heads of many important state agencies and state-run companies. At least 22 listed people had already been sanctioned by the Obama administration. The list was met with a combination of disbelief and derision in Russia, as mocking comments ricocheted around social media. Some joked that it had taken the Trump administration six months to photocopy the Forbes list of Russian billionaires, since they were all included, as well as the link detailing senior officials on the Kremlin website. Treasury officials confirmed that they did rely on Forbes, among other publicly available sources. The 96 oligarchs are each worth more than $1 billion, including well-known people like Mikhail Prokhorov, the owner of the Brooklyn Nets basketball team, and Eugene Kaspersky, whose anti-virus technology firm has been under fire in the West over allegations that it cooperates with Russian intelligence. One man on the list, Kirill Shamalov, who married one of Putin’s daughters, might no longer be in the billionaire’s club since they have recently split, Bloomberg reported. The announcement said there were more names on a classified annex provided by the Treasury Department, including lesser officials or businessmen worth less than $1 billion. Sen. Chuck Schumer, D-N.Y., the minority leader, said Tuesday that Trump was effectively circumventing the law and “afraid to sanction Putin” and his associates. Neil MacFarquhar reported from Moscow, and Peter Baker from Washington. Ivan Nechepurenko and Sophia Kishkovsky contributed reporting from Moscow, and Alan Rappeport from Washington.